When the opportunity presented itself to become a national sponsor of Build a Dream, we were immediately intrigued. We wanted to know more about the Build a Dream initiative, about the team behind the scenes, about the long-term commitment, and growth plans of the program. We were pleasantly surprised to learn that each volunteer member of the Build a Dream team had as much passion for the inclusivity of women and girls in STEM (Science, Technology, Engineering, and Mathematics) as their founder, Nour Hachem-Fawaz. We believe so strongly in this initiative that we brought Lenovo, one of our key vendor partners, into the campaign. 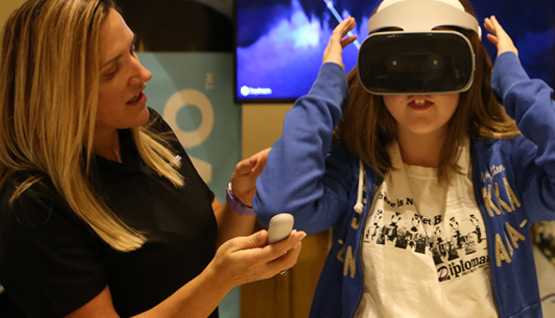 Next Dimension, together with Lenovo, have taken girls and their parents on journeys to faraway places while never leaving our event booth. We have given these young girls and their families the opportunity to jump into today’s technology by way of Virtual Reality (VR). As visitors put on the headsets and immerse themselves into faraway places, we discuss the many practical applications that are currently in development that use VR among various sectors such as manufacturing, health care, construction, and education. Consider adding your corporation to the list of sponsors already benefiting from this empowering movement. Together we can Build a Dream for the next generation of female leaders in Science, Technology, Engineering, and Math. Brandy Coulsey, Marketing and Vendor Relations Manager, Next Dimension Inc.